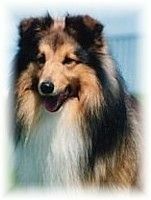 Ruskin was the Kennel's first homebred Champion and had an exciting and rewarding show career. Consistently in the ribbons he won an All Breed's Reserve Best in Show, and Best in Show at Specialty and Group level. Best of all however, he was "our boy", and a light went out in our lives when he quietly went to Rainbow Bridge on 28 November 2003. We miss you Ruskin.